I heeded my own advice last week and ordered some Sevilles from a farm down in Reedley, California. I only had in mind that I’d juice them, but they were so beautiful that I felt guilty not using every bit of them. To this end, I peeled them (zesting some for use), juiced them (used for mojo), extracted their pulp (from which I fashioned a rope… jk), dried and preserved the seeds (for planting, someday) and made this dessert with their piths. It is easiest to peel the Sevilles when they are firm, which is also a sure sign you have a fresh orange. Hold the orange in the palm of your hand as you peel in a clockwise motion (or counter if you are a lefty) with the other. I use a vegetable peeler but you can also use a sharp paring knife to peel the oranges. Either way, if you are a fruit peeling badass, you will peel the entire skin in one continuous strip. Cut the oranges in half, along their “waists”. Juice the oranges well, being ever careful not to tear the piths. I know you wanna get aggressive cuz you be juicin’, but please, be gentle! Remove the pulp and seeds content from each half. 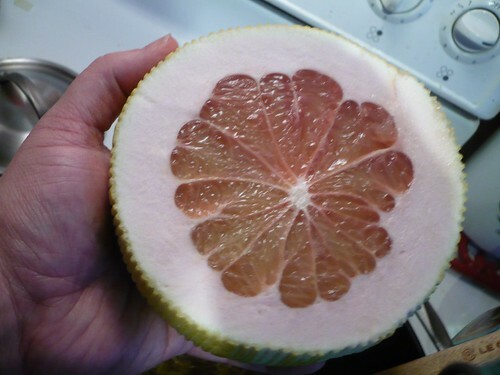 You want to get to the white, dry part of the fruit. I use a grapefruit spoon to get under one of the segments and then work my way around, scooping out the rest. Wash them and remove any remaining pulp matter. Place in a large pot with water to cover, under high heat and bring to a boil. Once it does, strain the oranges and rinse out the pot. Do this twice. If you omit this step the syrup and the oranges themselves will be way too bitter (unless you like it that way). Take your twice boiled oranges and set them aside. Place the pot back on the stove and add the 4 cups water, 3.5 cups sugar and the cinnamon stick and place under medium heat. Stir frequently until the sugar has dissolved. Add the orange halves to the pot, bring to a simmer, reduce heat to low and cover. As they cook, the orange piths go from an orangey white color to translucent. This doesn’t happen all at once and you will see them changing as you check every so often. They will take at least an hour and a half or more, depending on how chewy you want them to be. I like them a bit on the less chewy side so I cook for longer (up to 2 hours). Just taste for texture once they are translucent and see what you like. You will also want to taste the syrup and make sure it has some orange flavor (not just cinnamon). If the syrup is weak, take a couple of 3-4 inch segments of the peel and cook along with the piths for 15 minutes or so. BAM! Orange flavor boost. Once done, remove to a large bowl and let cool. Once they reach room temperature, place covered bowl in the refrigerator. Enjoy at your leisure; these will keep for a couple of months, at least. You can eat these straight up or on toast but I like them with a mild, savory cheese such as Monterey Jack, thinly sliced. The salty creaminess of the cheese perfectly balances the bitter sweetness. My mother usually made this dessert with grapefruit (available year round), using the same method. I’ve also seen this made with lemon. Maybe I’ll go eXtreme and try this with the largest of the citrus fruits, the Pumelo.